Viviana Caballero, was taught how to embroider and hand sew by her mother since she was 10 years old and she has always enjoyed it. Ms. Caballero has a Bachelor’s degree in Psychology, graduated from the Universidad Autonoma de Nuevo Leon. Viviana, has participated as an artist in the exhibit “100 Women, 100 Words” curated by The South Texas College Art Department and Library Art Gallery. In a busy world, sometimes it’s nice to slow down, take a minute and hand sew! 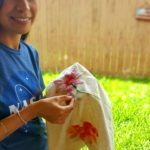 Join Viviana for a fun program where she will teach you the basics of hand sewing and embroidery. Viviana has prepared a program for you to create something different in every class. A tote bag, an original phone case, a personalized pillow, a decorative cactus and more! Whether you are an expert or just getting started, Ms. Caballero will guide you through the process until your masterpiece is complete. A $10.00 per participant, materials fee applies for each craft session. This fee will cover the cost of the materials provided for the project. Payments to be made in cash only.